Apart from looking at visual clues to determine water quality and ecosystem health, scientists also look at what is in the water to paint a more accurate picture of what is affecting quality and animal and plant life. To do this they measure samples from all types of waterbodies - both clean and dirty. Visual clues and what we measure in the water can be closely linked. Different scientific tests can be used to verify observations and build an understanding of what might be impacting a waterbody. Water depth and speed - can strongly affect the kinds of species that can live in a waterbody. Some have adapted to fast moving streams, others to still ponds. Water flows and availability can also impact water quality. Water temperature - determines the types of animals that can survive in the water, and can also affect the chemistry of the water. For example, cold water can hold more oxygen than warm water, which means that greater numbers of plants and animals can live in ecosystems with colder water. pH values - measure the water acidity. Many creatures cannot exist within water or cannot survive after drinking too much water if it is not within a healthy boundary. Nutrients - are important for plant and animal growth. Much like humans need nutrients in their diet, plants and animals need nutrients and react to fluctuations in available phosphate and nitrate. 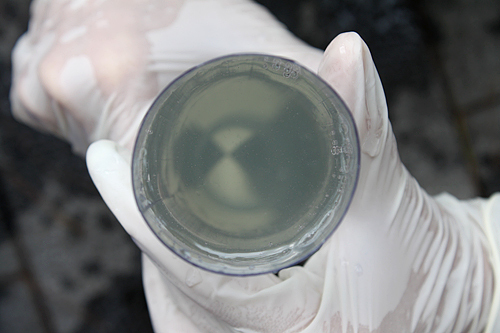 Turbidity - is the ‘cloudiness’ of the water and is another common method to assess water quality. High turbidity is caused by particles such as sediment or algae and can be an indication of poor water quality. All of these tests are important because often the pollution that has the largest effect on ecosystems tends to be invisible to the naked eye. We need to have accurate data in order to assess ecosystem health and to preserve water quality in the future. FreshWater Watch focuses on monitoring excessive nutrients - the most widespread water quality problem globally. Freshwater ecosystems need nutrients, but high levels can cause problems. Scientists test for these nutrients by measuring their concentration in a water sample. These nutrients have been measured across the globe for many years, so FreshWater Watch data will contribute to a huge bank of information and help us to understand how to improve water quality. 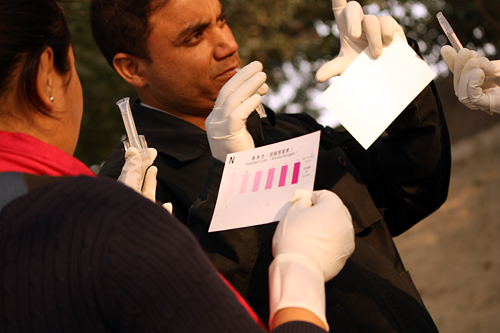 Turbidity is the second key indicator used by FreshWater Watch. Using a Secchi tube, we record the ‘cloudiness’ of the water. This gives an indication of how many particles there are in the water, and together with the nutrient reading can suggest if there was a recent algae bloom or if runoff is carrying too much pollution into the waterbody. Turbidity is linked with low oxygen levels in the water, reducing the concentration of plant and animal species. Elevated turbidity levels can also be a real problem for aquatic life as the increased particles have been known to clog fish gills, affect egg development, as well as make previous spawning grounds unsuitable by covering the stream or river bottom in sediment. Refer to the US Environmental Protection Agency for more about turbidity. Activity: In his poem In Praise of Walking, Thomas A. Clark explores the benefit of going for a walk and getting lost in the landscape. Put aside time this week to go for a walk. On your walk notice the details around you, the clouds, plants, and wildlife. Start thinking about how these are connected. Notice where water flows, and where or how plants grow. Where do you see more or different kinds of animals? Why might this be the case? Now you will be starting to think ‘like a scientist’.